Red Clydesiders. Where are their memorials in our city? The old aphorism says that "history is written by the victors". I was thinking about this after recently reading a book on the history of the Greek city of Thessaloniki. This tells the story of the Ottomans, Muslims and Jews that for centuries made up the majority of the population of what is now a decidedly Greek city. However in the city itself most traces of these previous inhabitants have been removed, as the city has emphasised its Greek-ness over recent decades. We know Glasgow for its "Red Clydesiders", its trade unionism and Socialist leaders of the past. But when you look at the city today you have to search hard to find any physical proof of this past. I was never taught about these battles and people in school history lessons. As heavy industry fades away from the city, even family memories of these past events are passing. The top floor in the People's Palace records some of these struggles, but elsewhere in the city traces of this are harder to unearth. In the recent Scottish independence referendum, the "No" result was a bitter disappointment for many people living in the poorest areas of Glasgow, who largely gave their support to a "Yes" vote. These are the people with most to lose from the status quo, and the most to gain by creating a fairer society. I believe that this goal was what drove the majority of voters in my city to vote Yes. Much was made of the public's engagement with ideas and politics during the referendum debate, as if this is some weird notion not for the likes of ordinary people. An 87% turnout for a vote is unprecedented in Scotland, where general elections are closer to 60% turnouts and council and European elections much less than that. The re-invigorated political engagement, the increased numbers of people joining the Greens, Scottish Socialist Party and SNP post-referendum, the support that organisations such as the Common Weal and Radical Independence Campaign have garnered, feels like a new thing. However I think it is more a case that many people have for decades felt powerless to control many aspects of their life, and that means job prospects, pay levels, watching the privatisation of essential services happening, feeling powerless even to affect their own health - it is part of the same problem. With all the main political parties telling you it has to be this way, why bother arguing? The referendum has re-awakened an old idea in people's heads. That ordinary people could join together and make things better. There are many forgotten episodes and individuals in Glasgow's working class and trade union history, people who believed that they could make a better world. It is strange that many of these stories are not commemorated on the streets of my city, Glasgow. My plan was to spend a day or two trying to tour about the city a wee bit to find out about some of them. So for the 24,079 people of Maryhill and Springburn who voted "Yes" as opposed to the 18,094 who voted "No" in the referendum, this is a look back to some other Glaswegians who thought change could bring greater equality. I hadn't heard of Thomas Muir of Huntershill until I read about him today in the People's Palace. He set up the radical "Friends of the People" organisation in Glasgow in 1792, inspired by the French Revolution and was transported 2 years later for sedition. He eventually escaped from Australia to America, passing through Cuba before ending his days in France. Nor had I heard of John Baird and Andrew Hardie, executed for treason in 1820 after leading a strike of 60,000 men in support of Parliamentary reform. There are little known men like George Millar who I've written about before. The "Maryhill Martyr" who was stabbed for trying to set up a union for calico workers in Maryhill in 1834. He once had a memorial plaque in a Maryhill churchyard, but for several years it has been held in storage by Glasgow City Council. At the start of the 20th century the Clydeside was becoming a hotbed of Socialist campaigns and ideas and by 1919, after events in Russia, the British government was even fearing revolution. One hundred years ago many women supported the militant tactics of those campaigning for woman's suffrage. Suffragettes even let off a bomb in 1914 in the Kibble Palace in Glasgow to try to further their aims. Helen Crawfurd, who had just been released from prison after a 5 day hunger strike was re-arrested on suspicion of the bombing. She later supported the, largely women led, rent strikes, campaigned against the First World War, joined the ILP and became a councillor in Dunoon. Mary Barbour campaigned alongside her in the rent strikes of 1915, organising local women to drive out sheriff officers and prevent evictions. She joined the ILP and became Glasgow's first female town councillor in 1920. There is no memorial to either of these women in Glasgow, despite their dramatic and active roles campaigning for the working people of the city. Other women became very politically active through trade unionism. The Singer Sewing Machine factory strike of 1911 was largely led by the women in the workforce, many of whom went on to become Socialists and active trade unionists despite the management winning the strike and victimising and sacking many people involved in it. Amongst those sacked was Arthur McManus, who later went on to become the first chairman of the Communist Party of Great Britain. His name was written alongside Grigory Zinoviev's on the forged "Zinoviev Letter" used in 1924 to discredit the Labour party. I've also previously mentioned Willie Nairn a Scottish Marxist I had never heard of before until James Kelman mentioned him in a talk I was at. Born in Brechin in 1856, he moved to Glasgow and became active in the Social Democratic Federation and the Co-operative Movement. He was president of the St George's Cooperative Society. Their building no longer stands but was at St George's Cross and this statue once stood at the top of it. The Co-operative Movement was one way many people tried to work together to help their fellow man, an idea that is growing in popularity around the world, such as in coffee producers getting together to sell their produce at a fair price, or in the ethos of our credit unions. Mill owner Robert Owen is often considered as one of the founders of the Cooperative Movement. Glasgow similar to the one in which David Dale lived. He put his theoretical ideas into practice in his mill town of New Lanark, 35 miles from Glasgow. Born in Wales in 1771, he met the daughter of New Lanark mill owner David Dale whilst on a visit to Glasgow and later married her. He took over the running of the mill town. He moved away from the "truck system" of paying the workers in tokens which could only be used to buy poor quality goods from the mill owner's shop and tried to implement ideas the co-operative movement followed, of bulk buying products of sound quality and selling them at near to wholesale prices, putting profits back into the town. David Dale was born in Cambuslang and lived on Charlotte Street, near Glasgow Green. Robert Owen is remembered in the name of Robert Owen House on Bath Street, which was home to the Scottish Co-op movement until recently, but it now appears to be closed. It will be a sad irony if the office space is taken over by some fund-managers, but much of the building has actually been converted into student accommodation. The Scottish Co-operative Wholesale Society was formed in 1868. Their aim was to create a co-operative method of production and distribution, supplying local co-operative retailers, they had a vision of a more equal and sharing society. As they expanded they took over smaller societies or opened their own local branches. They moved into banking, funeral care and hotels. They tried to supply their own raw materials, taking over a tea plantation in Ceylon and a timber supplier in Canada and they ran a factory complex in Sheildhall producing food, furniture, metalwear and clothing. They also were a place where many politically active women met up, in the popular Co-operative women's guilds. My memories of the Co-op is really just of running across to the one in Knightswood for my granny and getting to stick her Co-op divi stamps into her book afterwards. Or of going out to the Clydebank Co-op for school clothes. Nowadays it just seems to run along the same lines as other shops, and their banking sector seems to be as rotten as any other bank. The scale and grandeur of the Co-op Building beside the Kingston Bridge in Glasgow shows the scale of what they once managed to achieve, and many smaller scale operations look back to their ideals for inspiration with their new cooperative movements (eg Social Bite or the Bike Station in Glasgow). World War 1 led to many social changes, including the increased reliance on getting women into the workforce. Needing to increase munitions production the government passed laws to increase the power of employers over their workforce. Munitions Minister David Lloyd George spoke in December 1915 to the Clyde Workers Committee and munitions workers at St Andrew's Hall. The Mitchell Library now sits in what was formerly the St Andrew's Halls, gutted by fire in 1962. By introducing unskilled workers alongside the skilled workers, to increase production for the war effort on lower pay (Dilution of Labour) the workers felt he was planning to roll back gains they'd made in pay and working conditions. Lloyd George was shouted down and chased out of the building with "The Red Flag" ringing in his ears. At this point the workers could have maintained their defiance and put the ability of Britain to continue in the war in serious danger. There was a strong Socialist anti-war movement in the city at the time. Ultimately the workers were let down by their leadership, in particular David Kirkwood of the Parkhead Forge gets the finger of blame pointed at him for securing a dilution agreement. He later joined the ILP, then moved to the Labour Party and was eventually made Baron of Bearsden and sat in the House of Lords. In George Square the statues commemorate the great and the good of Scotland. I've written about the statues there before and if I had my way I'd get rid of most of them (except maybe Robert Burns and some of the scientists) and replace them with statues of more inspirational types. Why not Mary Barbour, Jimmy Reid or John MacLean? 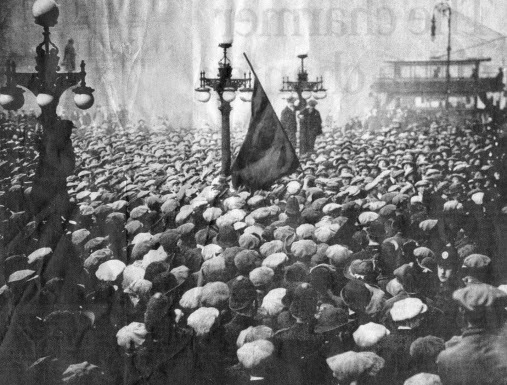 The picture above is from George Square in 1919 on the day later known as "Bloody Friday". The workers, led by the Clyde Workers' Committee, went on strike demanding a reduction in the working week to 40 hours, in order to help find work for soldiers returning from the war and avoid a build up of unemployed men being used to force down working conditions. The strikers had put their proposals to the Lord Provost and 60,000 gathered in George Square to hear his reply. 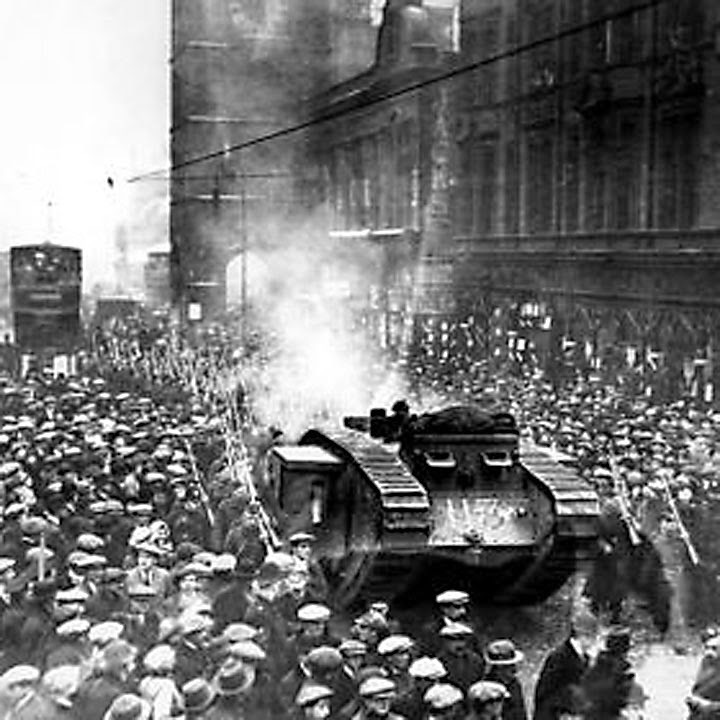 Fearing that a revolution might take place, Home Secretary Winston Churchill sent 10,000 English troops to Glasgow along with tanks and heavy weaponry. It was feared that local troops in Maryhill Barracks could not be relied upon to not join the strikers, so they were confined to barracks. A newspaper photograph at the time shows a red flag being raised in the crowd on 31st January 1919. Whilst the CWC leaders were inside the City Chambers the Police led a baton charge on the crowd, felling men and women. The demonstrators, led by many ex-servicemen, retaliated, forcing the police to retreat and battles continued through the streets. 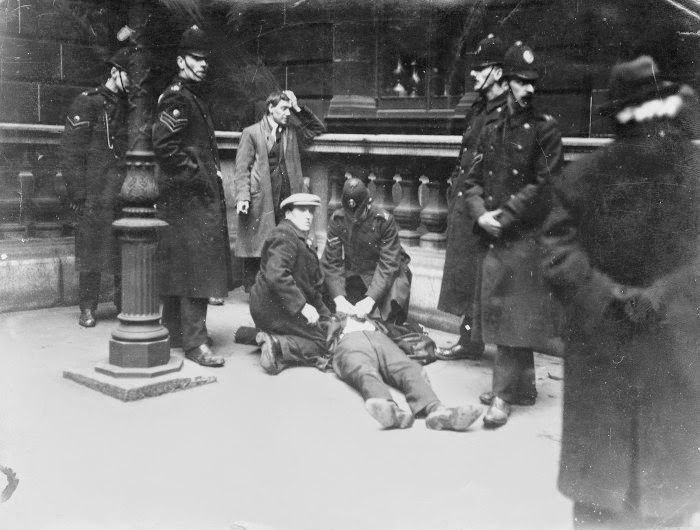 As the CWC leaders emerged from the city chambers some were arrested and David Kirkwood was knocked to the floor by a police baton. He was arrested along with Willie Gallacher, Emanuel Shinwell, Harry Hopkins and George Edbury. "more by the lack of working class ripeness than by batons, tanks and machine guns"
George Square has since then often been a rallying point for protest and rallies. 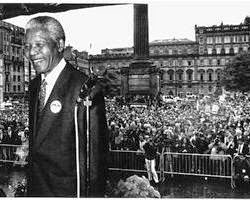 Nelson Mandela spoke here on his release from prison as he came to Glasgow to thank the city for the support he was given whilst a prisoner of the Apartheid regime in South Africa. The city council seems hellbent on turning the square into a naff fairground or money making site instead of it being a public space for the citizens of the city and a campaign has been set up to try to save it (Restore George Square). Uglier scenes were seen in the square recently when Unionist supporters gathered here the day after the "No" vote in the Scottish Independence referendum. All through the campaign the square had been a rallying point, mainly for "Yes" campaigners, but only on this night did the police have to get involved. 95 years after a red flag was hoisted in George Square, the Union Jack was being waved instead by people with their own way of viewing history. 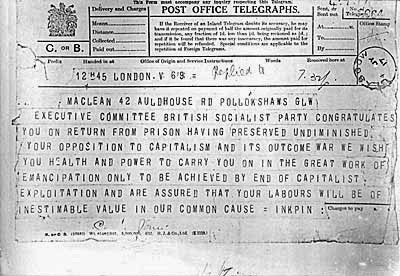 Neither the Co-operative movement or the ILP were revolutionaries, but John MacLean was. Born in 1879 at 59 King Street, Pollokshaws, John MacLean trained as a teacher. In 1903 he joined the Social Democratic Federation (SDF), an early Marxist organisation and spoke at factories and public meetings spreading their ideas. He started holding teaching classes in Glasgow on industrial economics and Marxist history, open to trade unionists and the general public. My granny lived at Gorbals Cross and remembered meetings being held by him in her dad's front room there. Strongly opposed to the pro-war stance which the SDF took, he joined the British Socialist Party in 1911 and became a strong campaigner against the war and against corruption. On Sunday evenings John MacLean would hold anti-war meetings at the former Corporation Transport Building on Bath Street at Renfield Street. In 1915 he was arrested under the Defence of the Realm act for his anti-war stance and when he refused to pay a fine was imprisoned and sacked as a teacher. He saw it as a war between imperialist powers in which workers should take no part and when he continued to speak out against the war he was arrested for the second time in Feb 1916 after a meeting here. Charged with sedition he was sentenced to 3 years imprisonment but released following public protests after 14 months. After the Bolsheviks came to power in Russia he was appointed as the Soviet Consul to Scotland due to the support he gave to their cause. He opened an office of the Soviet Consul on 12 Portland Street (which has been demolished), just south of the suspension bridge over the River Clyde. (Benny Lynch the boxer was a 4 year old boy living in the next street at this time). "I am not here as the accused, I am here as the accuser of capitalism, dripping with blood from head to foot." "Scotland must again have Independence, but not to be ruled by traitor kings and chiefs, lawyers and politicians....The control must be in the hands of the workers only, male and female alike..."
He was arrested again and again and after 5 terms in prison, hunger strikes and force feeding his health failed. Aged 44 he died in 1923. His funeral cortege was followed by a crowd of 10-20,000 to his final resting place in Eastwood cemetery. John MacLean and Robert Burns are the only Scots commemorated by Soviet postage stamps. In Glasgow we have nothing on a par with that. There is a plaque on the wall of the City Halls marking it as a site he spoke often at. In the People's Palace on Glasgow Green some of his papers are kept on display alongside his old desk. In 1973 on the 50th anniversary of his death a commemorative cairn was unveiled in Pollokshaws, close to his birthplace. It reads "Famous pioneer of working class education, he forged the Scottish link in the golden chain of world Socialism." From ancient times Glasgow Green always been a rallying point and meeting place. It was where James Watt came up with the ideas for his steam engine and Bonnie Prince Charlie tried to rally his Jacobite troops in 1746. A stone marks James Watt and a circular bench marks Bonnie Prince Charlie on Glasgow Green, but commemorations of other events on the Green are few and far between. On 6th March 1848 unemployed workers had gathered on Glasgow Green expecting to be given provisions. When none appeared speakers denounced the government and called for people to take what they needed. Serious rioting then erupted, with food shops and a gunsmiths at Glasgow Cross being raided. The army were called in as the rioters retreated towards Bridgeton and opened fire into the crowd with live ammunition killing at least one man and wounding many others. The leaders were given 18 years transportation. From 1872 until the time of World War 1 suffragettes used to gather at Nelson's column on Glasgow Green, which may explain why Emmeline Pankhurst was arrested in 1914 at the nearby Central Police station on Turnbull Street after a rowdy meeting. The Women's Peace Crusade rallied 14,000 women on Glasgow Green on the 8th July 1916, a women's crusade against the war, with many women who had lost sons or husbands in the war getting involved. Organising it were Mary Barbour, Agnes Dollan and Helen Crawfurd. On the 1918 May Day strike 100,000 workers downed tools. Some of them rallied here and demonstrated against the war and for worker's solidarity, then headed to nearby Duke Street prison to demand the release of John MacLean who had been arrested again. It was also the rallying point in Glasgow during the national General Strike of 1926. In more recent times the Anti-Apartheid Movement organised a rally here where 30,000 people came to hear ANC leader Oliver Tambo speak in 1988, two years before Mandela was eventually released from prison in South Africa. One memorial that you can find here is to Hugh MacDonald, commemorated on Glasgow Green with a fountain. The City Council Glasgow Green heritage trail tells us he was a journalist, famous for his book "Rambles Around Glasgow" (which I quite like the sound of). What it doesn't tell you is that he was also a supporter of the Chartist movement and wrote articles and poems for Chartist newspapers. Born in 1817 in Bridgeton to Highland parents, he was a Glaswegian social reformer and supporter of Chartism. 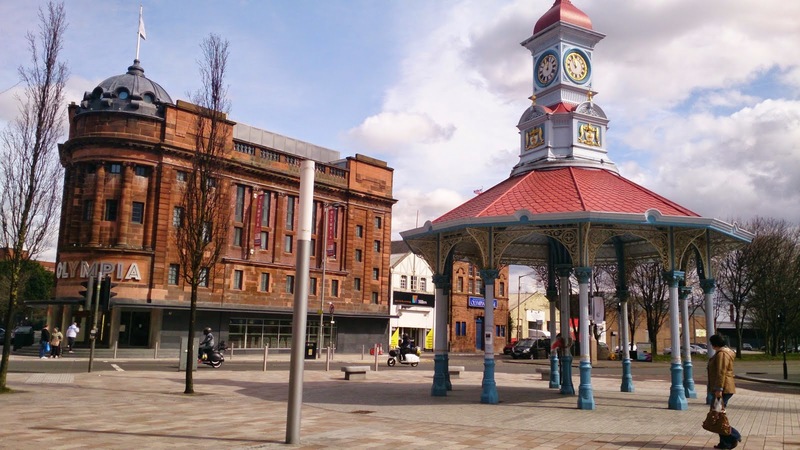 Bridgeton Cross was an important rallying point for Glasgow Chartists in the 1830s and 1840s, campaigning for the vote for all over the age of 21, although some disagreed on whether "all" should also include women. However there were two Female Chartists' Associations based around here at that time. In 1838 in Glasgow 100,000 people attended a rally in support of Chartism. Brigdeton Cross was also where James Maxton used to hold open air meetings. He was the Independent Labour Party MP for this area from 1922-1945. Presumably he kept on with his meetings even if someone thought to throw an egg at him. He was a leading figure in the Glasgow ILP. Like many of his colleagues he was a pacifist and spoke out against the First World War, for which he was imprisoned in 1916. He also spoke out in favour of Home Rule, wanting to transform the "English-ridden, capitalist-ridden, landlord-ridden Scotland, into a Scottish socialist commonwealth". He later tempered his views, feeling that the target of their fight should be against international imperialism. Kelvingrove Art Gallery have apparently a bust of Maxton, but when I was there today I couldn't find it, and there is no memorial to him at Bridgeton Cross either. (If you are at Bridgeton Cross I'd encourage you to spend a couple of hours trawling through the BFI archives in Bridgeton Library/Olympia). Nearby is the old Calton burial ground on Abercromby Street. Here are commemorated those weavers who died in what was probably Scotland's first major industrial dispute. Protesting against a 25% pay cut the weavers of Calton went on strike. The dispute carried on for months and when demostrators gathered on 4th September 1787, they were fired upon by soldiers. Three weavers were killed instantly and three more were fatally wounded. The memorial stones on the walls of the burial ground are now quite worn, but new plaques have been fixed around the graveyard to tell their story. Another noteworthy grave in Calton burial ground is that of Reverend James Smith, pastor of Abraham Lincoln's church in Illinois. In 1922 Glasgow returned eight ILP MPs, whilst in nearby towns the Communist Party was getting support at the ballot box. They departed to London from St Enoch Station, now a shopping mall, amidst cheering crowds (by the way, did you know that Saint Enoch was a woman, the mother of Kentigern, Glasgow's founder?). Two of the Clyde Workers' Committee strike leaders from 1919, Emanuel Shinwell and David Kirkwood joined other Independent Labour Party members such as James Maxton, John Wheatley, Neil MacLean and George Buchanan, in the House of Commons representing Glasgow. 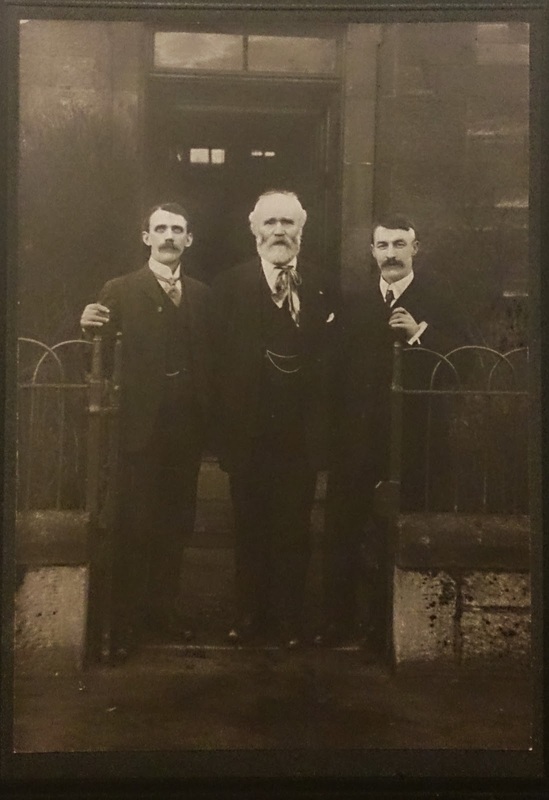 In 1922 my great-great uncle was unsuccessful as the ILP candidate for Kilmarnock, but became their MP a year later and joined his party in parliament. Meanwhile another CWC leader of that time was standing for the parliamentary seat in Dundee in 1922 for the Communist Party. It wasn't until 1935 that Willie Gallacher was elected as an MP, for West Fife. Apart from Willie Gallacher the Communist Party never achieved any real electoral success and some within the party felt that they should not even engage in a parliamentary democracy that they saw as unjust. Young shop stewards who were also members of the Communist Party led the successful UCS work-in, such as Jimmy Reid, Jimmy Airlie, Sammy Gilmore and Sammy Barr. When Upper Clyde Shipyards threatened to close the shipyards the union, instead of striking, decided to have a "work-in" and complete the orders they already had on the books. Although the state of Glasgow's shipbuilding industry today is precarious, without their efforts it would have died out 40 years ago. Maybe the best way to commemorate their efforts would be to invest in the yards now to keep what we have. The threat of closure still hangs over the remaining two yards at Govan and Scotstoun and if BAE no longer want to run them, why not nationalise them, invest in new technology and re-name them? Perhaps the "No Hooliganism, No Bevvying Yards" or suchlike. These men and women were all fighting for social justice and a fairer society. It is important that they are not forgotten and that we remember them and their ideas. They can inspire us, and others, to reject injustice and inequality as they themselves did. As part of that I think Glasgow city council needs to look at ways to tell its people about their history, not to let it be forgotten. A series of paintings by Ken Currie hangs in the People's Palace , telling the story of the working people of Glasgow. It was commisioned in 1987 on the 200th anniversary of the massacre of the Calton Weavers. The last panel is called "Unfurling Our History", the artist's vision of the future. A group in the centre are learning about their history through Museum collections and unfurling a banner of the future to come. That is why I think we need to spend more time remembering these men and women.